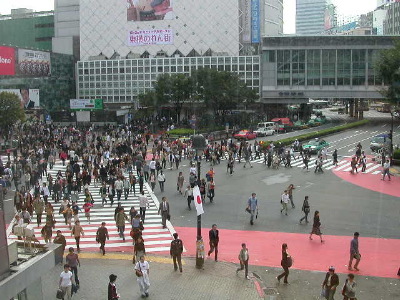 This is a very famous and oft photographed intersection in Shibuya. I was not a tourist in Tokyo though. I came there to shop and to meet old friends. I came to Tokyo again to write the GMAT. You can spot the tourists from the foreigners who work in Japan. The foreigners who work in Japan have cell phones. I was super happy to have my　ケイタイ to elevate me slightly above the slack jawed riff raff. This was my view from upstairs in Starbucks.